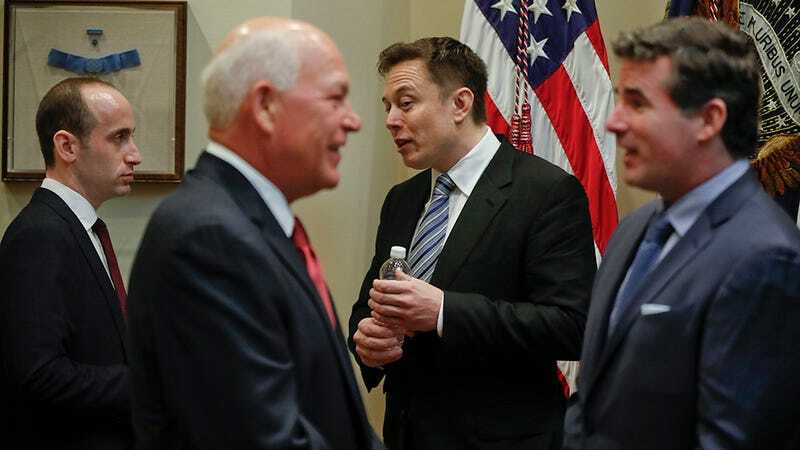 Unlike Uber CEO Travis Kalanick, Elon Musk still warms a seat on Trump’s Strategic and Policy Forum. It’s part of playing the game, we suppose, and Musk himself has framed his choice to remain a voice in the administration as a means of getting more moderate opinions into the President’s ear. Maybe he forgot about all that? Shortly after noting a Tesla driver’s bravery in stopping a potentially deadly accident, Musk sent out a succession of three tweets which were almost immediately deleted. The tweets also referred to this executive order as a Muslim ban, which, while accurate, is a term the administration has tried to push back on—an administration Musk seems intent to stay in the good graces of. Were these drafts sent in error? A cry for help? Musk claims they were the former, referencing a tweet from January 28th with markedly softer language: “not right” was reduced to an even wimpier “not the best”; “Muslim ban” because “entry ban.” Ah, to think what could have been. Meanwhile, Musk’s tweeted endorsements of Secretary of State and former Exxon-Mobil CEO Rex Tillerson remain undeleted. In any case they remain far less embarrassing than Press Secretary Sean Spicer’s accidental password tweeting habit.